This farm was purchased by Heming James Bomford, 1813-1895, who rebuilt the house to its present dimensions. Marjorie and Ruth Bomford are his direct descendents and they now live opposite Exhall Court in a house called “Westering”, which they built when the farm was sold. 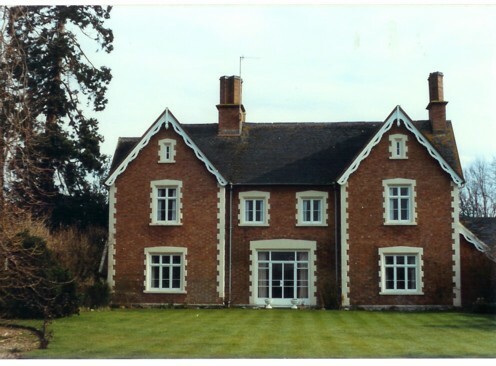 Their grandfather Henry Butler Bomford married Mary Evans and during the years they lived in Exhall Court they brought up eight children, four sons and four daughters. 1. Hugh Evans Bomford, married Emily Adkins and lived at Exhall Court. 2. Philip Bomford, lived at Dunnington Court. 3. Reginald Bomford, lived at Old Dunnington Farm. 4. Walter Bomford, died aged 18 years. He was drowned at Bude when he dived into the sea from a rock. 5. Theodora Bomford, married Mr. Mace. 6. Gertrude Bomford, married Mr. H. Davidson. 7. Winifred Bomford, married Mr. Frank Sisam. 8. Grace Bomford, married Mr. Raymond Hodgkinson and they lived at Harvington. His wife, Emily was related to the Slatter family of Salford Priors. Her mother was a Slatter from Salford House, first cousin to Marion Slatter and John Slatter was her Uncle. This relationship explains how the farm called Slatter Farm came into the possession of the daughters of Hugh Bomford, who sold it in the 1960s to Michael Bomford. Frank Adkin’s of Adkins and Thomas owned the Mill at Broome and he was Emily’s eldest brother. 1. Mary Bomford – died. 2. Elizabeth Bomford, married Mr. Henry Smith of Clay Hall, Bidford, and lives at Stratford-on-Avon. 3. Ruth Bomford, lives at Exhall. 4. Marjorie Bomford, lives at Exhall. These two ladies kindly supplied most of the information concerning the family at Exhall. Hugh Bomford was known widely as Jumbo Bomford, but his daughter Marjorie affirms that he was known as Jum to his immediate family. Hugh died in 1965 [2 November 1960] and the farm was managed by Marjorie for five years, then taken over by her sister Betty, Mrs. Henry Smith. In 1976 the farm was put up for sale. The half to the North was bought by the Hon. Michael Wills, son of Lord Dulverton of Broadway. This portion of the land adjoins the land attached to Oversley Castlewhere Michael Wills resides. The portion to the South, some 80 acres, were purchased by Mr. John Canning. Oversley Court was formerly owned by David Greig, the owner of a prosperous chain of grocery stores. Lord Dulverton lives at Batsford, above Broadway Hill. He recently sold Broadway Towerand other parcels of land nearby. Marjorie and Ruth retained a plot of land opposite the farm house and built a detached residence which they now share. Their Great Grandfather was Heming James Bomford, 1813-1895, who married Letitia in 1837 and lived at Dunnington Court. Their Great Great Grandfather was Thomas Bomford, born 1781, who was married to Sarah Pearce. 1. Kathleen Bomford, married Mr. Staff from Cleeve and they live at Rochester. 2. Muriel Bomford, married Mr. Cook and lives at Quinton. 3. Molly Bomford (Pogey), married Mr. Stowe, a soldier and they live in Swansea. 4. Jack Bomford, lives at Roxhall near Warwick. Married to Raymond Hodgkinson and they had four sons, Harry, Peter, Bernard and David who died young. They also had two daughters, Sheila a well known tennis player and Pat. Bernard Hodgkinson worked at Bomford Bros., and was resident at Pitchill House for many years. After the companies merged he was employed by Bomford and Evershed as Manager, Spares Dept, and he travelled widely for the firm when he held his final senior position. He married Betty Eaton from a well known riding family and they moved to Marsh Farm on Ragley Estate when Bernard retired and Pitchill was sold. He is also a keen and proficient tennis player.